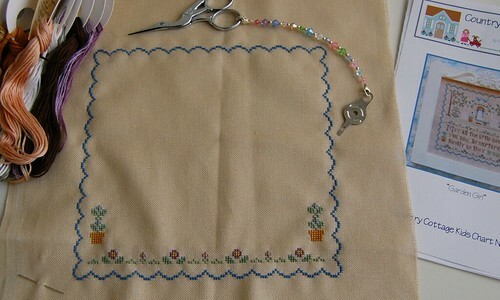 Since my eyes were so tired last night I decided to start Country Cottage Needleworks "Garden Girl." I worked on it until 11:30 pm and almost finished up "Queen of Swords" by Sara Donati. I ended up finishing it this morning. It was a great book. I'd love to find the other books on CD in the series. Anyway, here's what I got done on Garden Girl last night. My pastel fob matches pretty well I think. :) The fabric is 32 ct. Lambswool Jobelan and the threads are DMC. Thank you all for your very kind comments on my P&P finish! :) Write later! So beautiful. The colors are so vibrant! I love the blue! I have a question. Do you stitch on a stitching stand or Q Snaps or in-hand? Just curious. I am always looking for ways to improve my stitching technique. I have another question (thank you for answering the other one so quickly!) Where can I get the egg-shaped thread drops that I saw in a previous post of yours? I am having trouble locating just the plain egg ones. I have seen flip flop and rabbit shaped. Looking good Nicole! That is some fast stitching! WOW!!! BTW P&P was fab too!